Use this as a craft you can hang in your window as a decoration -- the sun shining through the melted wax is lovely. There is an option at the bottom for younger kids, instead of melting crayons or check out the tissue paper version of this craft. glue stick or white glue. ADULT: Plug in the iron and cover the ironing board with scrap paper. Set the iron to medium (no steam). Tear a piece of waxed paper that's square (or a bit longer than it is wide) and fold it in half. Then unfold. Take the paper off the crayons and 'sharpen' them in the pencil sharpener. Let the shavings drop onto 1/2 the waxed paper. For our poppy we used mostly red shavings and a little pile of black shavings in a small circle in the centre. When you have a nice pile of shavings refold the waxed paper. Fold about 1/2 inch around all the edges so none of the wax leaks out when you iron. Place the waxed paper containing the shavings down on the ironing board and cover with more scrap paper. Iron for a few seconds. Peek and iron a bit more if necessary. All the wax should melt. If you used multiple colours the longer you iron, the more your colors will mix. You'll find that nothing happens, nothing happens, nothing happens and then BAM it's totally melted, so just keep waiting a few seconds at a time and peeking so you don't burn anything. Let it sit about a minute to cool. Fold a piece of construction paper in half and then in half again. Don't crease very much (the less you crease it the better, but young children may need it creased quite well). Print the template (link below) and cut out the half poppy shape. 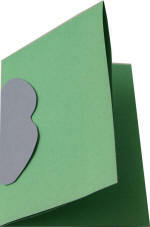 Line up the flat edge of the half poppy shape with the folded edge of the construction paper. Trace the half poppy shape onto the construction paper and then cut it out. Unfold the last fold of the construction paper and you'll see a poppy shape in the middle. Unfold the construction paper again and put glue around one of the cut out poppies. 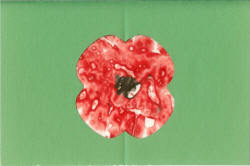 Put your waxed paper ("stained glass") onto the glue and cover the cut out poppy shape. Put glue around the poppy shape on the other half of the construction paper and fold it over so the 'stained glass' is sandwiched between the construction paper. Thanks Geri for sending this in! "Have the kids color a picture with crayons. They can color dark or light - it doesn't matter but the darker sometimes looks better. They really do look like stained glass pictures, especially if the picture had heavy black lines." Use crayons, NOT markers or colored pencils. Have a few bowls with a VERY small amount of cooking oil and a couple of cotton balls in them. Have the kids flip the pages over and slowly and thoroughly rub the cotton balls on the paper. (You'll see the paper turn transparent and the colors come through). Put them aside to dry (usually doesn't take long)! Cut them out and either hang them as is with a hole punched in them or frame them with construction paper. Thanks Terri for sending this in! Use clear Contact Paper and tissue paper pieces. Put Contact Paper piece sticky side up on the table (may need to tape it down). Cover with another piece of Contact Paper sandwiching the tissue in between. Frame with dark construction paper as directed for the melted crayon version.